Cave 85 at China’s Mogao Grottoes, where the GCI has been working with the Dunhuang Academy on conservation and management of this World Heritage Site. Photo: Anna Zagorski, GCI. In July the Getty formally announced the upcoming exhibition Cave Temples of Dunhuang: Buddhist Art on China’s Silk Road. 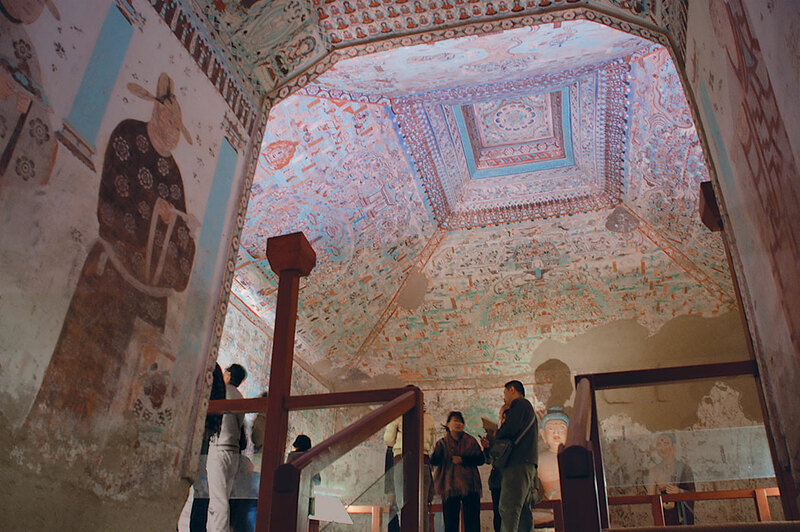 Organized by the Getty Conservation Institute, the Getty Research Institute (GRI), the Dunhuang Academy, and the Dunhuang Foundation, the exhibition will celebrate over twenty-five years of collaboration between the GCI and the Dunhuang Academy to conserve and protect the Mogao caves. With their exquisite wall paintings and sculptures, the Mogao caves bear witness to the intense religious, artistic, and cultural exchanges along the Silk Road, the trade route linking East and West. Paintings on silk, textiles, drawings, and manuscripts on loan from the British Museum, the British Library, the Musée Guimet, and the Bibliothèque Nationale of France—objects that have rarely, if ever, traveled to the United States—will be on view, as will rare books and maps from the GRI’s Special Collections. Among the objects to be exhibited is the Diamond Sutra (a sacred Mahayana Buddhist text) from the year 868. The Diamond Sutra is the world’s oldest dated complete printed book. It was found, as were all the other objects to be exhibited, in Cave 17, also known as the Library Cave, where some fifty thousand objects, sealed up for a millennium, were discovered in 1900. In addition, three full-size cave replicas, hand painted by artists at the Dunhuang Academy, will be installed on the Getty Center’s plaza, allowing visitors to experience the cave temples for themselves and to learn about their conservation. The Robert H. N. Ho Family Foundation is the Presenting Sponsor of the exhibition. Lead Corporate Sponsor for the exhibition is East West Bank, and Lead Sponsor for the exhibition is the Henry Luce Foundation. The exhibition will be on view from May 7 through September 4, 2016.